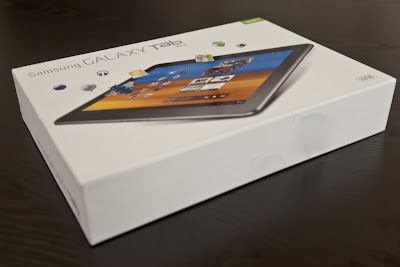 I managed to put my hands on to a Galaxy Tab 10.1 last week and I was happy to try it out. Thanks for the device for Slava. This is a 32GB Wi-fi only version, with 1280x800 TFT touch screen, Dual-core 2 x 1GHz CPU as I learned it after turning the box upside down. I removed the serial numbers and other identifying numbers from the photo. I was too lazy, so I did it in Lightroom, these are the visible smudges at the side of the box. I was also lazy on taking the photos: I did not have my lights with me when I made the shots, and the indoor lighting was just enough for these. The built-in flash would have been even more lame, so after taking some test shots, I quickly abandoned it. Nevertheless I hope these photos and my experience will be useful for some. 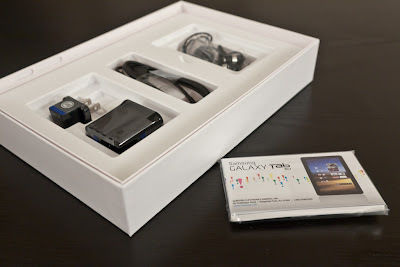 The box contained the charger with a US plug, the Samsung standard earphones (similar ones were given to the Galaxy S and Nexus S and the old Galaxy Tab), a small brochure about the device and the cable. This is not a micro-USB cable as it is usual among the phones. Samsung had its own style. The device itself is really sleek. Very thin, and just simply beautiful. It is easy to hold in hand and not too heavy to carry around. 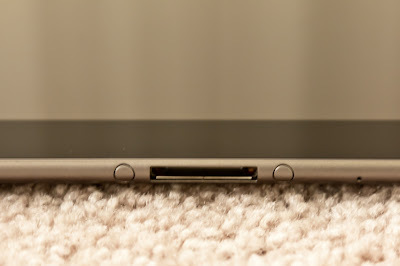 The USB cable connects at the bottom of the device. 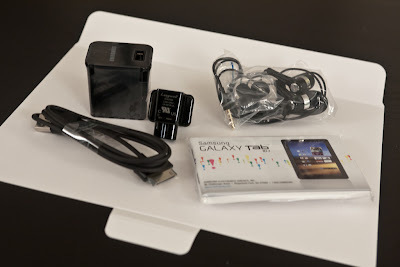 It charges over USB, unlike the Motorola Xoom. The volume buttons and the power switch is at the other side. If you hold the tab in landscape mode, then it is at the top left, if you hold it in portrait mode, it is on the top right. This is also some kind of Samsung standard, Nexus S and Galaxy S also suffers from it. Can anyone explain the logic behind it? 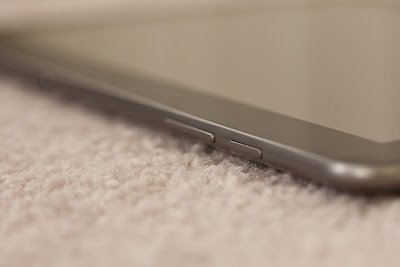 I think that the on/off switch belongs to the narrower side of the tablet/phone and while HTC, Apple and even Nokia seems to understand this, Samsung seems to deliberately go against it. 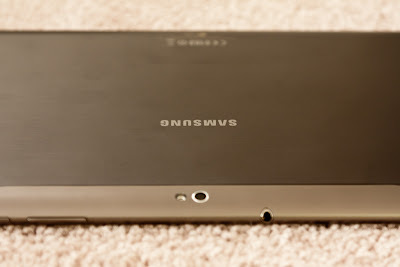 The back of the device is nice and smooth. The front and the back camera is located at the top in landscape mode, which is better if you prefer taking photos and video-chatting in landscape. Note, that the iPad has the front-facing camera at the narrower side, which is good for portrait-video chat, but in landscape mode it is strange. Just imagine videochatting with someone who always look left or right of you. Interestingly Apple promotes the iPad with a landscape videochat in their iPad landing page (4th picture). I have no clear opinion on which one is better, probably putting the cameras to the longer side makes it less off the center, so the videochat does not seem that unnatural then. After unpacking, I started using the device. 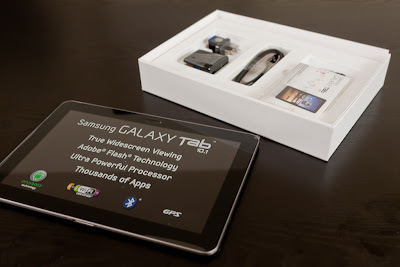 My first impression was that the screen quality became much better over the 7" Galaxy Tab, even the automatic brightness seemed to be pretty usable. 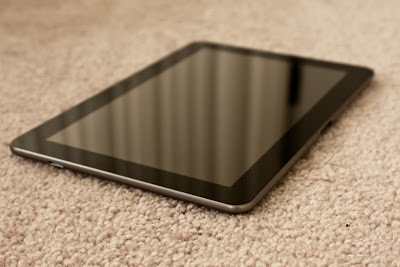 It is also better than the Motorola Xoom, of which I had a washed-out feeling when I compared them directly. 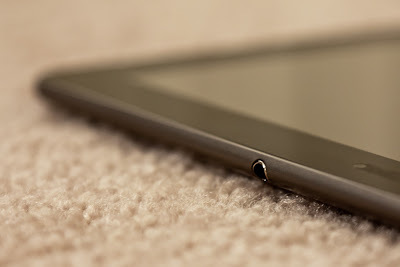 The Galaxy Tab 10.1 is also lighter and thinner than the Xoom: 565g vs. 708g and 8.6mm vs. 12.9mm. I was satisfied with the battery life, I only needed to charge the device in roughly every 3 days. I was slightly worried about the build quality, though. I did have it only for a week and managed to make a scratch at the edge and I felt that it is too thin to be durable. 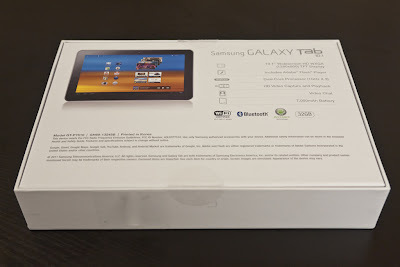 I don't want to introduce the Android 3 Honeycomb OS, the UI basically the same as other devices which recently hit the market, Samsung did not do too much customization there. After a few hours of usage, the browser seemed to be pretty fast, the operating system seemed snappy, the gaming experience was good, the Market app looked really nice, Gmail was like a charm and the overall usability of this device was more than satisfactory. Oh, well, if I set up my favorite live wallpaper, the home screen started to slow down significantly, but, well, this wallpaper is not designed for the 1280x800 resolution I assume. Overall I really liked that device and I recommend it. 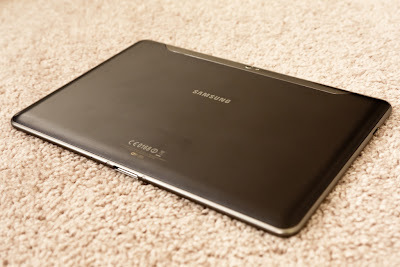 Personally I always carry my laptop around, so another device would not make sense in this large form factor. A 7" or a 8.9" version would be much better for my taste, so I'm looking forward to try out those when they come out!